Chocolates are very special for Christmas. We used to prepare many desserts made out of Chocolates such as cakes, brownies, drinks..etc for Christmas. This is a popular cup cake generally liked by all without any age difference and it is commonly available and easy to make. I used to make Chocolate cup cakes usually many times and could not able to post due to one or the other reason. But this time i wanted to post some basic recipes too for this Christmas so that everyone can bake some yummy treat for this Christmas. 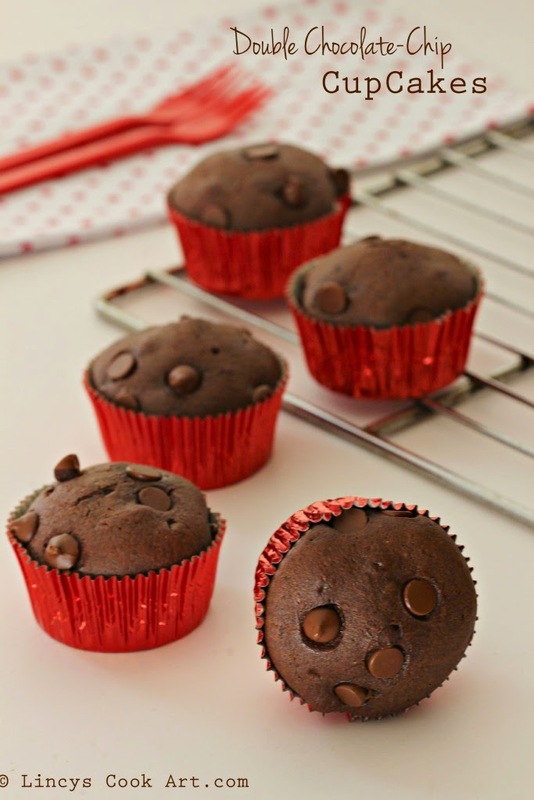 This is an easy to bake yummy chocolate chip cup cakes without any effort. You could use milk or dark semi sweet chocolate chips for this recipe. These cup cakes are perfect for parties to eat with out any mess. Could be made and stored a day or two prior to the party and can be used. In a bowl beat the eggs with oil till fluffy and pale mixture. Then add the powdered sugar and beat well till frothy. With the all purpose flour add the cocoa powder, baking powder, baking soda and salt; sift/ sieve well by passing though a strainer two times to get a uniform mixture. Add in the sifted dry ingredients into the wet mixture and fold well using a spatula. Now add the vanilla essence and hot milk and mix well. Add some hot water if needed to dilute the cake batter to a semi solid pouring consistency. Line the cup cake tray with cupcake liners. Fill the cup cake liners 3/4 with batter. Sprinkle some more chocolate chips on top. Preheat the oven to 180 degrees for 10 minutes and bake the cup cakes for about 15-20 minutes or skewer / knife inserted at the centre comes out clean. Love the cupcakes ..Fantastic presentation lincy ..
beautiful pics lincy :) and the cupcakes look awesome..